While Sony’s PS3 console has been floundering in the marketplace (until recently when the price cut for the 60GB model occurred), their previous generation console, the PS2, has still been going strong especially in markets that are just being flooded with video game consoles (such as developing countries and the like). Needless to say, the PS2 is currently priced at an all time low and you probably won’t see the retail price go any lower from here onwards. 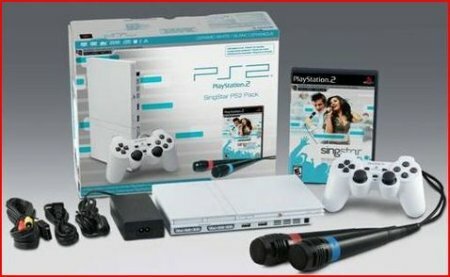 In order to make the PS2 even more attractive, SCEA has just dropped an announcement that there will be a new SingStar Playstation 2 pack which will be available in North America, namely the US and Canada. SingStar Pop is the second release in the franchise, and will feature actual songs from chart toppers of today and yesteryears such as Alicia Keys, U2, Rihanna, Ashlee Simpson, The All-American Rejects and The Clash. If you’re interested in giving those vocal chords a workout, the SingStar Pop PS2 bundle will set you back by $150 in the US, while those residing in Canada will have to fork out 160 Canadian clams. Sounds like a pretty good deal to me, as it is attractively priced within the “impulse buy” bracket. Heck, for those of you who have just suffered from a broken PS2 for the umpteenth time, why not get this bundle as a replacement? Unless, of course, you want to make the leap to the current generation PS3 and its stripped down compatibility feature. Coming in a ceramic white color that is extremely pleasing to the eye (just imagine that Apple has taken the PS2 for a spin in their factories in order to get a better picture), the PS2 retains all the full hardware functionality such as DVD and CD playback capabilities, digital surround sound, a couple of memory card slots, and an integrated Ethernet port for network gaming purposes. What sets this bundle apart is the inclusion of the SingStar Pop game as well as a couple of SingStar USB microphones for you to sing your heart out.